CT Monuments.net » Blog Archive » Civil War Monument, Pittsfield, Mass. 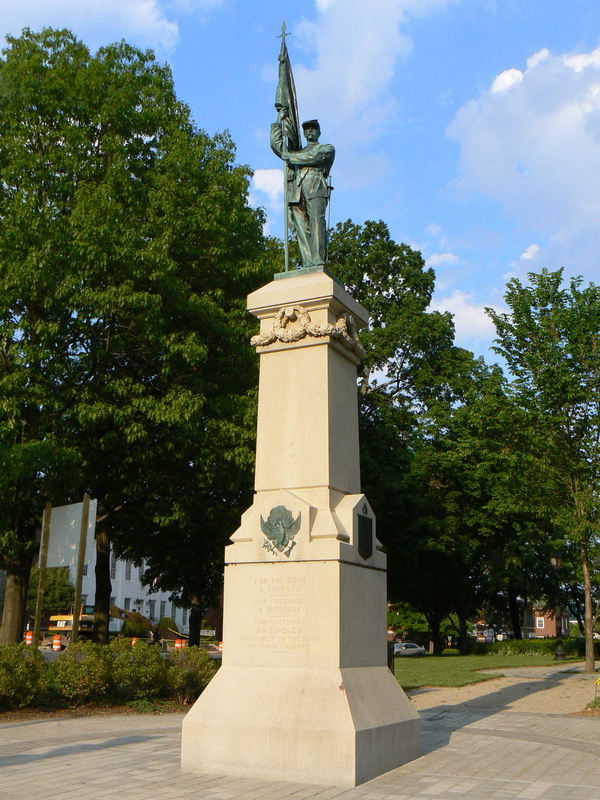 Civil War Monument, Pittsfield, Mass. Pittsfield, Mass., honors its Civil War heroes with a statue of a standard-bearer atop a 25-foot-tall monument at the intersection of North Street and Park Place. The monument, at the west end of a park, was dedicated on Sept. 24, 1872. The front (west) face of the monument bears the inscription “For the dead a tribute, for the living a memory, for posterity an emblem of loyalty to the flag of their country.” The front face also bears a bronze depiction of the United States seal. 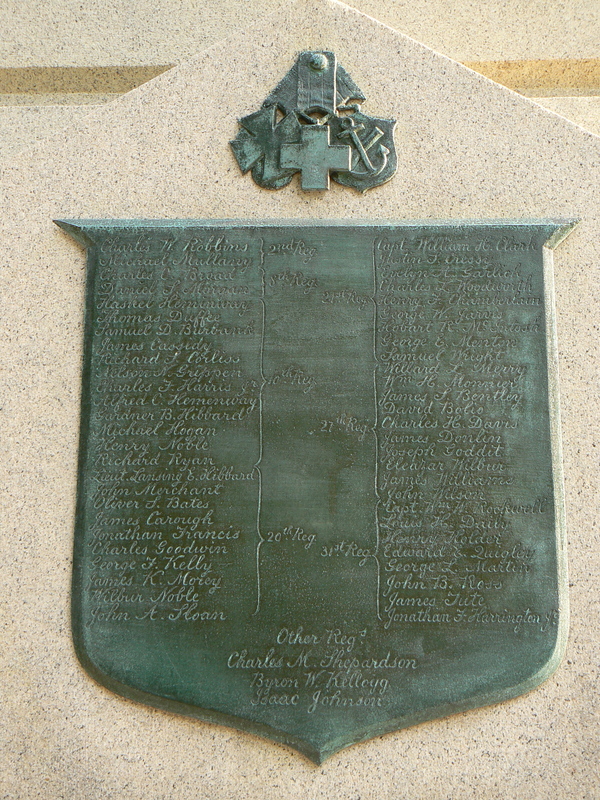 The south face bears a bronze plaque, in the shape of a shield, listing the names of 52 people killed during the conflict. The names are arranged alphabetically within 10 regiments that are engraved, uniquely among the Civil War monuments we have examined so far, with cursive lettering. 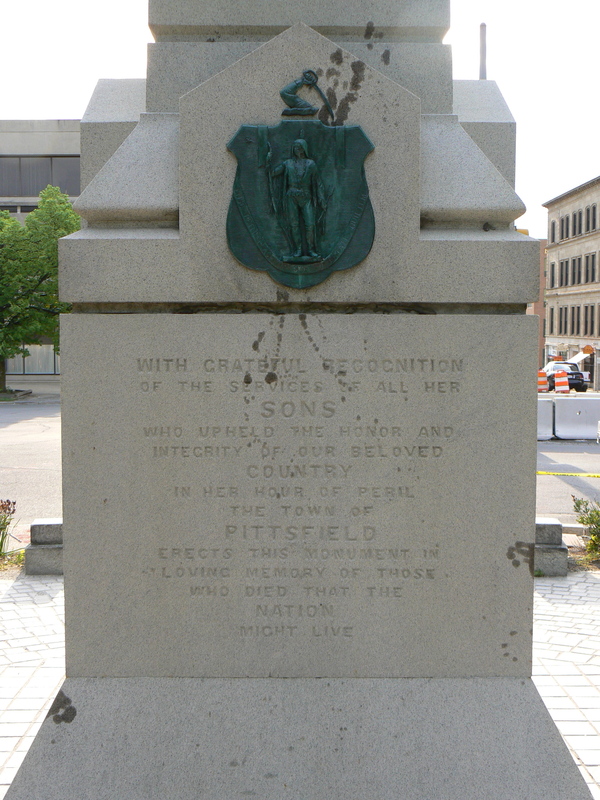 The east face has a bronze depiction of the Massachusetts seal, and a dedication carved into the monument reading “With grateful recognition of the services of all her sons who upheld the honor and integrity of our beloved country in her hour of peril, the town of Pittsfield erects this monument in loving memory of those who died that the nation might live.” The east face has been stained with appears to be oil. The north face bears a shield similar to the north face, listing names from seven regiments. 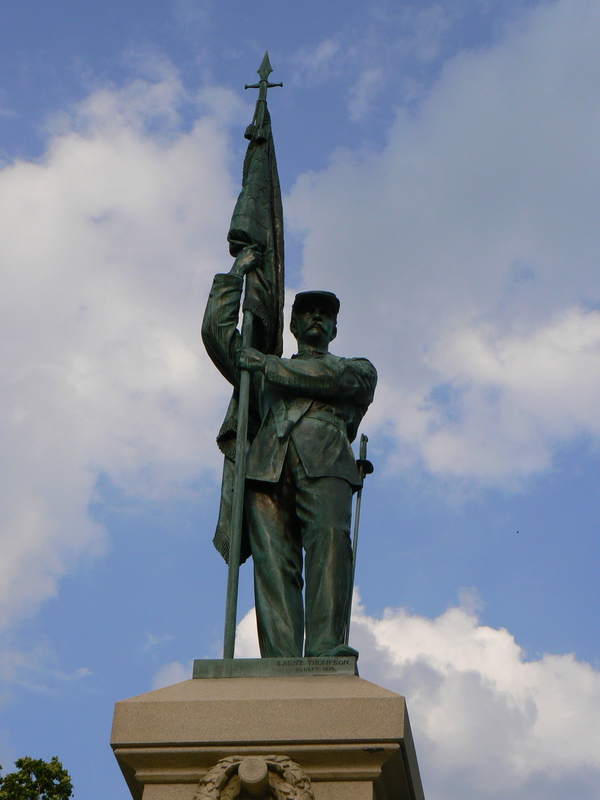 The standard-bearing bronze figure atop the monument was sculpted by Launt Thompson, who was also responsible for a number of other statues, including one of Civil War Maj. General John Sedgwick at West Point. The Civil War monument stands at the west end of a small park. At the east end, a monument honors the men and women who served in the Vietnam war. Previous post: War of the Rebellion Monument, Stockbridge, Mass.